This species is accepted, and its native range is N. America, Caribbean. W. South America. Very common in some parts of tropical Africa and a serious pest on cultivated plants. Stems yellowish (drying pale brownish straw-colour), slender, mostly 0.1–0.3 mm. in diameter. Flowers small, about 1.5 mm. long and broad, and only 2.5 mm. when the capsule is mature, greenish-yellow, in rather compact cymose clusters; pedicels mostly shorter than the flowers. Calyx-lobes obtuse or somewhat acute. Corolla-lobes triangular, acute, equalling the corolla-tube. Stamens shorter than the lobes; filaments about 1 mm. long. Scales large, adnate only at the base, much fringed apically and almost or quite reaching the anthers. Styles about 1 mm. long, slender. Capsule depressed-globose, not splitting at the base, drying pale brownish straw-colour; intrastylar opening small, ± 0.75 mm. long. Seeds ± 1 mm. long. Parasitic on Clover ( Trifolium) and a variety of other plants, sometimes spreading to forest undergrowth; 1000–2000 m.
Stems slender, up to 0.3 mm. in diam. Inflorescences very dense cymose globose clusters. Flowers up to 2 mm. long and broad, greenish-yellow, often glandular; pedicels usually shorter than the flowers. Calyx about enclosing the corolla tube, broadly campanulate; lobes ovate to circular or broadly triangular, usually obtuse to rounded, mostly overlapping when young. Corolla campanulate; lobes triangular, acute, equalling the corolla tube, spreading with often inflexed apices. Stamens shorter than corolla lobes; filaments longer than, or about equalling, the anthers. Scales large, adnate only at base, much-fringed apically and almost or quite reaching the anthers. Ovary globose; styles slender, becoming thicker and conspicuous in fruit. Capsule usually depressed-globose with a depression around the style bases, not splitting at the base, with the intrastylar opening small. Seeds ovate, about 1 mm. long, flattened on one side. Alabama, Arkansas, California, Central European Rus, Colombia, Colorado, Connecticut, Cuba, Delaware, District of Columbia, Dominican Republic, Ecuador, Florida, Galápagos, Georgia, Haiti, Illinois, Indiana, Kansas, Kentucky, Leeward Is., Louisiana, Manitoba, Maryland, Masachusettes, Mexico Central, Mexico Northeast, Mexico Northwest, Mexico Southwest, Michigan, Minnesota, Mississippi, Missouri, New Jersey, New Mexico, New York, North Carolina, Ohio, Oklahoma, Oregon, Pennsylvania, Peru, Puerto Rico, Québec, Rhode I., Saskatchewan, South Carolina, Tennessee, Texas, Trinidad-Tobago, Virginia, Washington, West Virginia, Windward Is. 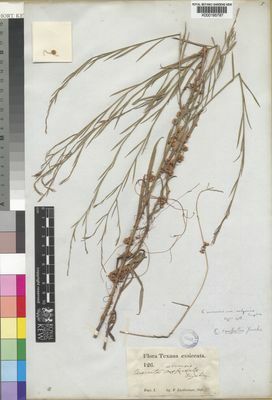 Cuscuta arvensis var. calycina (Engelm.) Engelm. Cuscuta pentagona var. subulata Yunck. Jafri, E., Asssadi, M. & Ghanbarian, G.A. (2016). A revision of Convolvulaceae family in Iran Iranian Journal of Botany 22: 23-29. Oganesian, M.E. (2013). 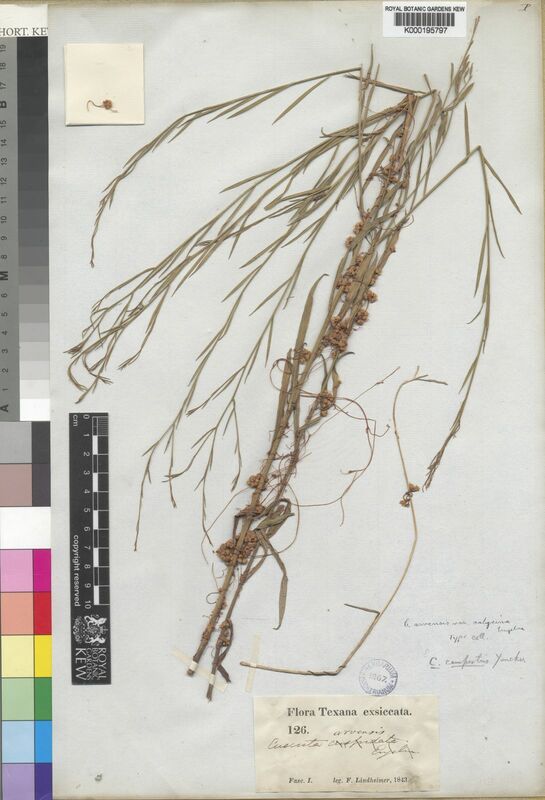 The genus Cuscuta L. (Cuscutaceae) in Armenia Takhtajania 2: 50-53. Wester, L. (1985). Checklist of the vascular plants of the Northern Line Islands Atoll Research Bulletin 287: 1-38. Correll, D.S. & M.C. Johnston in Correll, D.S. & M.C Johnston (1970). Cuscuta, in Man. Vasc. Pl. Texas Manual of the vascular plants of Texas: 1255-1261. Texas Research Foundation. Meeuse in Bothalia 6 : 648 (1958). van Ooststr. in Nederl. Kruidkundig Archief 52 : 164, fig. 1 (1942). Yuncker in Mem. Torr. Bot. Club 18 : 138, fig. 14 (1932).